NOLA is known as America's most interesting city, producing a most distinctive musical style. So, for a band like The Plum Magnetic it's fitting to follow the same musical effervescence. 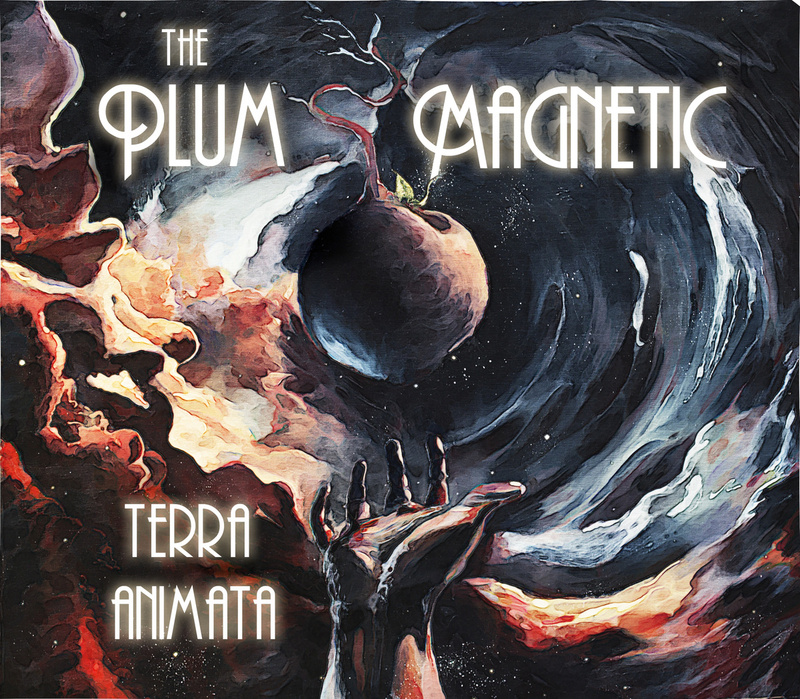 The Plum Magnetic's most recent record, Terra Animata, sounds larger than their four members. Infusing sonic sounds of classical Hindustani with American roots music, their vibe has a calming effect. They have weaved a tapestry together of classical tracks that take the listener on a journey to India, to the Caribbean, to Cajun country, as well as out of this world. Their focus on this album is to blend global musical elements that create an eclectic whole. Just under an hour, the eight tracks are mostly instrumental with a slight touch of vocals. Trent Ciolino plays an atypical electric six string banjo; Andrew McLean plays a killer guitar and tabla; Jon Solomon plays a jazzy bass, and Oliver Burke rounds-out the sound with his drums. The band has definitely been influenced by an eclectic array of musicians. You can hear a bit of '60s Mahavishnu Orchestra and a bit more current Bella Fleck and the Flecktones, as well as the Reggae sounds of Jamaica. The album begins with "Spring" an inaudible 25-second chant that leads into seven lengthy tracks. There is an ethereal light and heavy quality to this album that is both simple and complex, but overall cohesive. For instance, "Trece Leche's" classy, jazzy infusion works well with the banjo juxtaposed to the guitar. The bass and drum aesthetically complement the piece. Although the craftsmanship of McLean's slide guitar takes prominence, the remaining strings and percussion remain consistent and equal in importance throughout the project. And if you listen closely you'll hear some brass instruments lurking in the background thanks to a few special guest performers. After the jazzy listen, the Reggae sound on the following track "Sweet Confusion" may take you by surprise. While the strings still carry the song, the percussions get a little heavier, and it is here where the mellow vocals of Ciolino come into play. "Sweet Confusion" might get you wanting to move with the groove or bop your head to the guitar licks. By mid-album, the band makes use of the tablas to bring in a more exotic element with "The Electric Jungle." This track can be described as classic elegance alongside "SheshBesh" which has that same orchestral arrangement layering with a rock flavor. Toward the end of the project, there are two lengthy tracks "Parallax" and "The Delicious" that take you on a long musical journey through variations in tempo and rhythm before closing the effort on a Reggae note. Terra Animata the last track -- and the title of the album -- bring back the vocals of Ciolino, but this track seems out of synch with the project as a whole. Ciolino's voice appears to be struggling to hold-up to the instrumentals. And it probably would have served the album better if they had dropped the vocals altogether on this closing track. As lovely as this album is the last 30 minutes start to sound a bit familiar, but not a total redundancy. The band shows-off the musicianship of each member up until the end of the effort producing a fruitful and alluring sound just like the band's name. You can listen to The Plum Magnetic's Terra Animata on BandCamp.